On Sunday, Anne, ThingOne and I and some of our NCT antenatal class (and their babies) went on a sponsored walk in Chilford Hall in Linton. According to Alan Partridge, Linton is equidistant from London and Norwich, and so of course I was excited to be there. Last year we did a similar walk in a different location. Anne was seven weeks pregnant and we walked 13 miles. This year we attempted four miles, as we figured ThingOne wouldn't be up for much more. We managed it, so we are skill. To be honest, ThingOne didn't really walk the four miles, and I ended up carrying her most of the way - the lazy girl. That evening I had to get a flight to Copenhagen, because I am an international jet-setter, I am I am. I'm in Frankfurt next week. Get me! (I've been working for my current employer for over two years and this is the first international travel I've done.) I was running some training at our office there - the first proper training I've run. The fact that I was training people for whom English wasn't their first language didn't bother me, since of course Danes speak English as well as most Europeans. We should be ashamed of ourselves. I managed to do a bit of sightseeing on one of the evenings, wandering around Copenhagen looking at what I was supposed to look at. 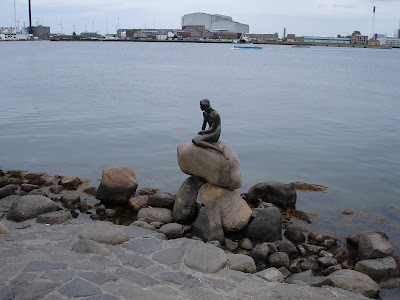 I'd been warned that The Little Mermaid statue is disappointing, so when I saw it was a bit rubbish with a largely unattractive backdrop I wasn't disappointed at all. I wandered through Copenhagen listening to Cinecast, a movie review podcast (soon to be renamed Filmspotting for legal reasons). Mission Impossible 3 was being given a largely positive review. I approached the famous Tivoli Gardens, an old fashioned funfair and thought about going in. Over the road was a large Mission Impossible 3 poster outside a cinema, and I don't get to go to the cinema much now we have ThingOne. Should I see Tivoli Gardens and soak up some more of a famous city, or should I go to see an action flick? You can guess can't you? I enjoyed my first bit of foreign travel with work for a while, but it struck me that tourism on you own isn't a lot of fun. Copenhagen's fine as a city, but not a hell of a lot different from many others. I didn't have a guide book, so I was having to make up the history and "facts" about the place in my head. Perhaps if I'd gone the whole hog and actually read something about it I might have been more interested. Still, I liked Mission Impossible 3 (M:I:3) and took Anne a large Toblerone home, so it wasn't a wasted journey.